This best-selling, easy-to-read book describes the Inner Bonding process of learning to develop a loving, spiritually-connected inner Adult self who can take care of your Child within - which is your feeling self. 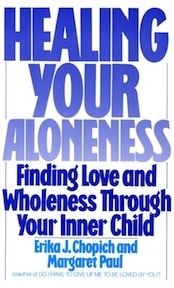 "The authors, Margaret Paul, Ph.D., and Erika Chopich, Ph.D., in the book 'Healing Your Aloneness: Finding Love and Wholeness Through Your Inner Child', provides a new and fresh understanding of the inner world. They have created a valuable roadmap for healing the child within us, and in that way becoming more emotionally free, integrated, and whole." "Through this process I went from being my last resort to being my own best friend! Meeting my inner-child was the most rewarding moment in my life. I finally experienced the total goodness and light that is the essence of my being -- my true self. What could be a more powerful gift. It feels good to be whole!" "This book is a profound look at the cause of inner pain and, most importantly, offers a way of healing." "It is very obvious that the authors are onto something big. They have made an explicit and important break with other 'child within' writers by emphasizing that it is not simply a healthy Inner Child or Inner Parent but a healthy relationship between the two which is the key to personal health. The work is practical, compelling, and very readable."